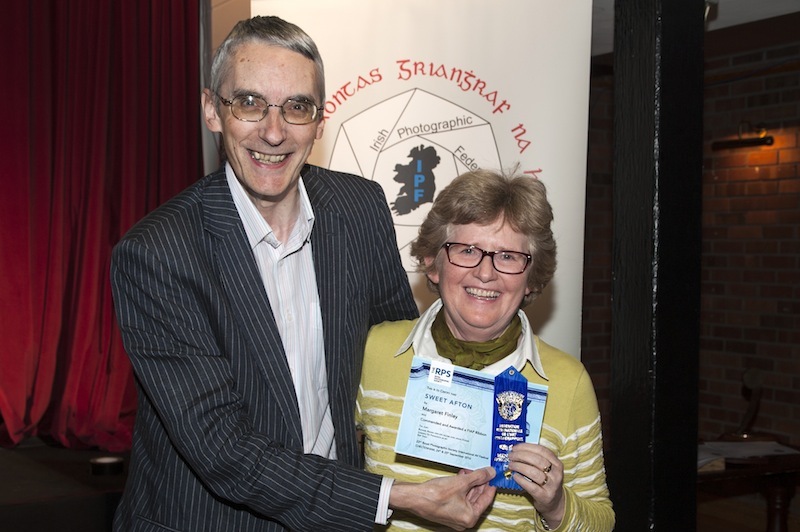 Report of the Irish Photographic Federation’s 34th National Audio Visual Championships held on 15th & 16th October in Aras Chronain Ionad Culturtha, Clondalkin, by Lilian Webb, AIPF, Event Co-ordinator. The weekend was a great success. Keith Leedham, FRPS, EFIAP, FIPF judged the 27 sequences over Novice, Intermediate, Advanced & Club categories. There were entrants from Limerick Camera Club, Celbridge Camera Club, Shannon Camera Club, Offshoot Photographic Society, Malahide Camera Club, Palmerstown Camera Club, An Oige Photographic Group & Enniscorthy Camera Club. These were all judged on Saturday, 15th October. 29 people enjoyed a Gala Dinner in Aras Chronain on Saturday night. The results are below and the winners were presented with their awards on Sunday afternoon with the showing of 8 sequences. 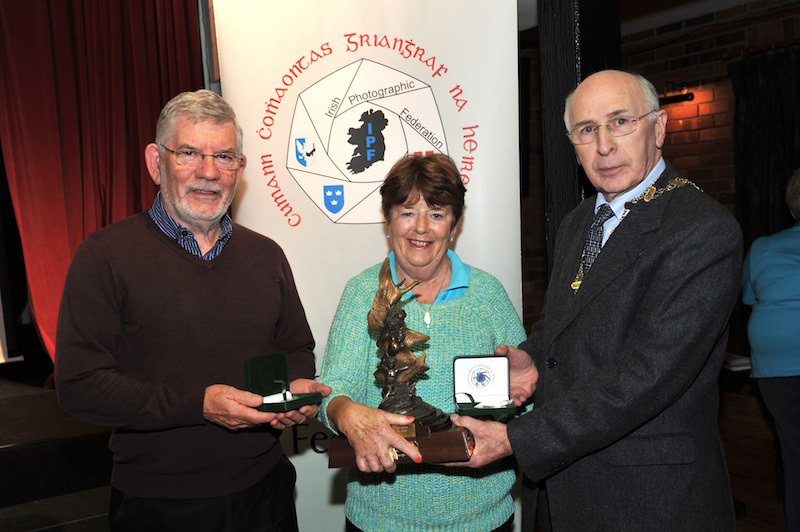 We were delighted to have Sheamus O’Donoghue, Shannon Camera Club and entrant as Vice President of the Irish Photographic Federation to present the awards, together with the chain of office. Malcolm Imhoff, FRPS, FACI (M) judged a Leeds/NIPA/IPF AV Showdown with 7 sequences from each. The winning federation was NIPA with James Hamill & Raymond Hughes joint runners up with “What Might Have Been” and “To What End?” respectively and the overall winner was James Hamill with “Mountains Of The Mind”. The Irish Photographic Federation sequences and their authors were: Rita Nolan, LIPF with “Journey Of The Soul”, “Sweet Afton” by Margaret Finlay, LIPF, “Winter Reflections” & “Stained Images” by Edwin Bailey, LIPF, “Unhurried Time” by Yvonne Acheson, LIPF, “Lost Reflections” by Brendan O’Sullivan, AIPF and Celbridge Camera Club’s “St. Bridget’s Pastures“. A selection were shown on Sunday morning, while all 7 from both NIPA & IPF were shown in Leeds on Friday, 14th October. East Leinster Audio Visual Group proudly presented their first ever print exhibition in conjunction with the AV National Championships. Rita Nolan organised the exhibition and other exhibitors were Alan Lyons, Bridie Maughan, Brendan O’Sullivan, Christy Doyle, Diarmuid O’Donnchadha, Lilian Webb, Joan O’Callaghan, Eamon O’Murchu, Liam Haines, Marie McGuinness, Margaret Finlay, Pearl Walsh, Dallas Camier and Pat Collins. Prior to the showing of the prize winning sequences and presentation of awards, Keith Leedham showed a selection of his sequences entitled “Judge the Judge” including his most successful “For The Sake Of Example”, “The Assignment”, “William McGullock”, “I believe” and “The Grey Ghost”. Many thanks on behalf of the committee, Alan Lyons, AIPF, Edwin Bailey, LIPF, Christopher Doyle, LIPF, Margaret Finlay, LIPF, Rita Nolan, LIPF, Marie McGuiness & Brendan O’Sullivan, AIPF, Chairman to everyone who made the weekend the success it was and to Brian in Aras Chronain and the catering staff.